Raft Wars is a turn-base shooter game developed by Martijn Kunst. 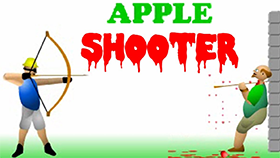 If you’re a fan of this specific type of shooter game then this is the game for you. When you start up the game, you’ll be surprised by the cartoony and kid-friendly looking art style. This game series is composed of 2 parts consisting of the original which you are playing right now and the sequel titled Raft Wars 2. The game itself is about a boy named Simon who dug up gold and diamonds on a beach and soon became rich, news is spread by the media and at the same time, bad guys are also looking to steal the boy’s treasure. Your job is to help the boy along with his brother as they fend off against the bad guys that are approaching the beach wanting to steal the treasure. 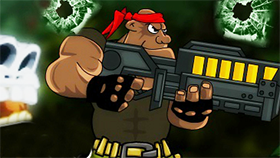 In each stage, you face off with many different types of bad guys ranging from pirates, Vikings, and even the mafias. After each stage, the enemies will be equipped with even more advance weapons and they will be place in harder to hit locations. 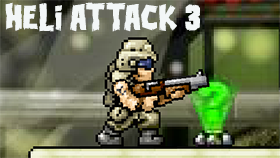 The characters you control as well as the bad guys each have a health bar. Depending on the force and the angle of your shot as well as the type of bullet, the damage will differ, and if the health bar on either side is depleted then your character or the enemy will die. If all of your characters die then you lose, but if all of the enemies die then you’ll have pass the stage. Each time you pass a stage, you’ll receive credit Besides that, you’ll also receive bonus points if you achieve these requirements: the number of shots fired is fewer than required amount for each stage, pass the stage with the least amount of time taken possible. You can use credits to buy weaponry for yourself like grenades, missiles or to upgrade your raft. This game only requires you to use the mouse. Move the mouse to aim your shot and click the mouse to fire your weapon. 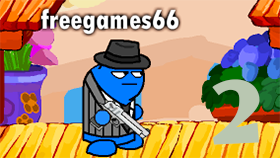 Shooting the bad guys into the water is the fastest way to defeat them. Grenades that drop into the water will not explode. Use missiles and grenades to cause more damage. The hippos in the middle of the sea will block and redirect your shots.